Back to school time is fast approaching, and students are getting excited. I love seeing the notebooks, folders, and colorful backpacks on display in stores: It reminds me of when I shopped for my own school supplies at the local drugstore. 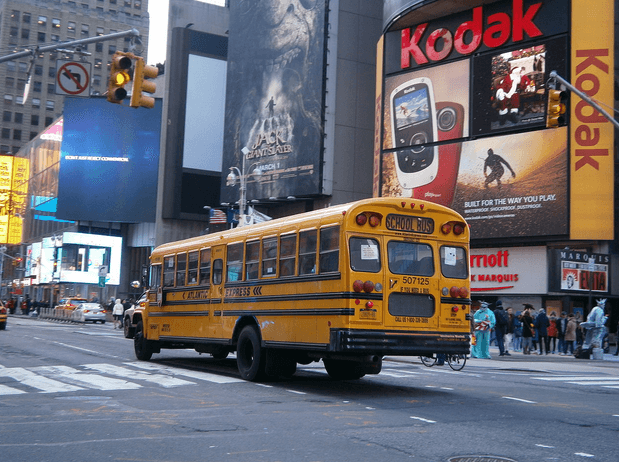 But for parents planning a move to New York City, sending the kids off to school can be a stressful proposition, since there are so many different schools all over the city to choose from. Like anywhere else, people who move here often consider the quality of the local schools when deciding on where they want to live, so to help out those of you who might soon be my neighbors in the Big Apple, I’ve put together a list of some of the best public, private and specialty schools in the city. Robert Seaman Elementary School. This school has 326 students and is located at 137 Leahy St. in Jericho. A student-teacher ratio of 9:1 is one of the reasons why it is one of NYC’s top public elementary schools. Students in each grade learn about kindness and social responsibility by participating in events to raise money for charity. Robert Seaman Elementary has earned Blue Ribbon public school status for its superior academics. Cantiague Elementary School. Located on 678 Cantiague Rock Road in Jericho, this school is home to 389 students. The students at Cantiague have test scores that far surpass the state average. Like Robert Seaman, Cantiague Elementary is a Blue Ribbon school. George A. Jackson Elementary School. Located at 58 Maytime Drive in Jericho, this elementary school has 431 students. The 11:1 student-teacher ratio is an appealing feature to many parents, as are the above-average state test scores. Jackson Elementary is recognized for its excellent music program. Lakeville Elementary School. Lakeville Elementary is located at 47-27 Jayson Ave. in Great Neck. This school is home to 743 students and is a Blue Ribbon School of Excellence. Each year, Lakeville Elementary hosts a Cultural Heritage Celebration where students sample foods and learn about the traditions practiced by different cultures. E.M. Baker School at 69 Baker Hill Road in Great Neck has 596 students. An 11:1 student-teacher ratio contributes to this school’s A+ rating for teachers and academics. Students participate in fun and creative activities to celebrate Earth Day each year, a highlight of the school year. Stuyvesant High School at 345 Chambers St. in NYC has 3,297 students. This high school is more than a century old and has a study program that puts an emphasis on science, math, and technology. In fact, 99% of its students are proficient in reading and math. In addition, Stuyvesant’s students and faculty have achieved a variety of honors and awards. Staten Island Technical High School has 1,248 students and is located at 485 Clawson St. on Staten Island. The number of students in this school who are taking advanced courses surpasses the state average. In 2015, nine students from Staten Island Technical were semifinalists for National Merit Scholarships. Bronx High School of Science. Located at 75 West 205th St. in the Bronx, this school instructs 3,019 students who are 99% proficient in reading and math. This school has a Holocaust Museum & Studies Center open to students and others who want to learn about this history. Great Neck South High School has a student body of 1,218. It is at 341 Lakeville Road in Lake Success. There is an 11:1 student-teacher ratio at GNSHS, and there are more than 25,000 titles in the school’s library. Townsend Harris High School educates 1,133 students and is located at 149-11 Melbourne Ave. in Flushing. Ninety-nine percent of students at this high school are proficient in reading and math. THHS offers a variety of Advanced Placement courses in subjects such as Spanish, calculus AB/BC, computer science, and world history. Columbia Grammar and Preparatory School is located at 5 West 93rd St. This grammar school teaches children from pre-K through fourth grade. There are 5.7 students for every teacher in the elementary school and about 1,290 total students at Columbia Grammar and Preparatory School. The curriculum includes math, science, social studies, language arts, and music. The Dalton School is located at 53 East 91st St. The First Program at Dalton instructs children from kindergarten through third grade. Along with a curriculum of core subjects, students at Dalton learn Spanish, dance/theater, music, and science from specialist teachers. Dalton has approximately 1,300 students. The Chapin School has 783 students and is at 100 East End Ave. The Lower School at Chapin instructs girls in kindergarten through third grade. This school has four art studios, eight laboratories, and two music studios along with other facilities to enhance a child’s education. Dwight School, the Lower School, is for students in grades kindergarten through five. The school is located at 291 Central Park West. This school has 574 students and places a lot of emphasis on teaching languages such as French, Spanish, and Mandarin. Collegiate School (Lower School K-4) is at 260 West 78th St. This is a school for boys with a curriculum that includes the core subjects as well as art, music, physical education and technology. The student body consists of 660 individuals. Horace Mann School has 1,694 students and is located at 231 West 246th St. in the Bronx. There is a student-teacher ratio of 8:1. This school offers courses in seven foreign languages and more than 20 Advanced Placement classes. Horace Mann has its own art gallery displaying the creative work of students and faculty. Trinity School has 986 students and is located at 139 West 91st St. There is a student-teacher ratio of 7:1, and it’s been in operation since 1709. Many students in this school move on to Ivy League colleges after graduation. Collegiate School has a student body of 748 boys. The student-teacher ratio is 7:1. Located at 260 West 78th St., the students at this school have access to a library with 45,000 books in circulation along with an e-book collection. Regis High School is at 55 East 84th St. This Catholic high school for boys instructs 529 students. The student-teacher ratio is 10:1. Instructors have an average of 14 years of teaching experience. The students at RHS are from a variety of socio-economic backgrounds. Riverdale Country School has a total enrollment of 1,140 students. The upper school is located at 5250 Fieldston Road in the Bronx. Students take college prep courses and may sign up for theater, music, singing, and other classes related to the arts. High School for Math, Science, and Engineering at City College is located at 240 Convent Ave. Students at HSMSE can get internships at Mount Sinai Medical School and the Grove School of Engineering at CCNY. The school has a student body of 463 individuals. Professional Performing Arts School is located 328 West 48 St. and has 554 students. Students get the opportunity to study acting, singing, dancing, instrumental music, and more in a supportive environment. The High School for Environmental Studies has 1,339 students. It is at 444 West 56th St. Students take hands-on college prep courses, complete research projects, and have access to internships. Fiorello H. LaGuardia High School is located at 100 Amsterdam Ave. This public school has approximately 2,730 students. Students are challenged with academic courses as well as instruction in music, art, and the performing arts. Hunter College Elementary School is at 71 East 94th St. It specializes in instructing intellectually gifted children in kindergarten through sixth grade. Fifty children are accepted into the kindergarten class each year. Hunter College Elementary school nurtures each child’s talents and interests.